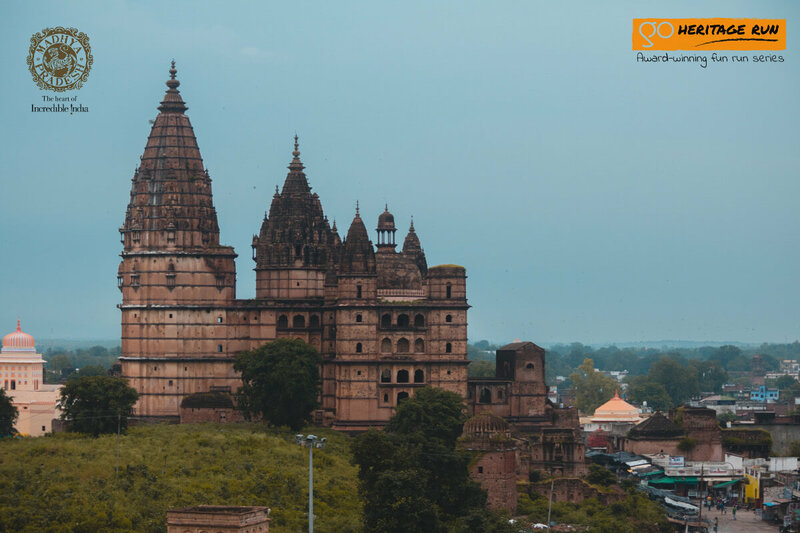 Orchha Fort: The fort complex is within an island formed by the confluence of the Betwa River and Jamni River in Orchha town approached from the eastern part of the market in the town through a multiple arched bridge with 14 arches built in granite stones. Jehangir Mahal, Raj Mahal, Sheesh Mahal and Rai Praveen Mahal are part of the Fort complex. Jehangir Mahal: Jehangir Mahal has 236 chambers laid around a vast,central courtyard out of which a total of 136 lie underground. The floors are arranged in tiers that ascend or descend in a random yet spectacular manner. 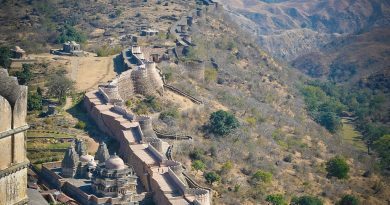 This, accompanied by massive bastions in its four corners, tends to make the palace look like a fort from the outside – uniform, sturdy, solid and impenetrable – defended by a massive wooden gate that completes its fort-like aura. Raja Mahal: Standing adjacent to Jehangir Mahal, is the much older Raj Mahal with an east-facing entrance. 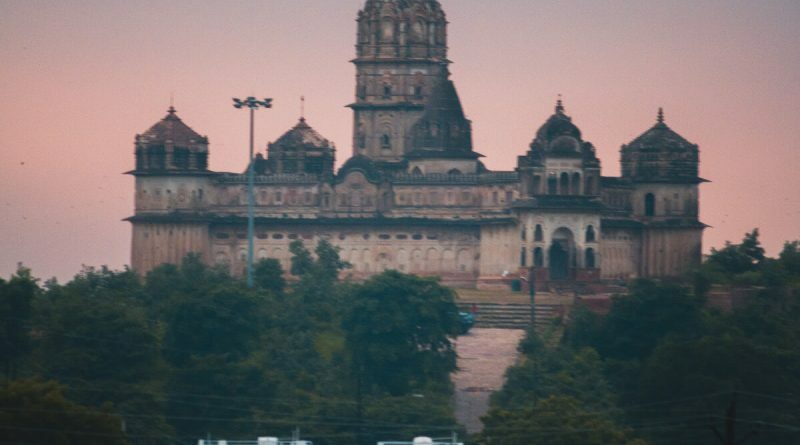 It is said to have been built by Raja Madhukar Shah (1554-1592) the father of Bir Singh Deo. Though Percy Brown dates it to 1575, many believe that its construction was begun by Raja Rudra Pratap Singh (1501-1530) and the structure taken to its lofty heights by his son and successor Raja Bharti Chand (1531-1554). On the top floor, you can see the remains of the exquisite mirror work on the walls. Reflecting the mixture of Rajput and Mughal architecture, the Raja Mahal houses two audience halls – the Darbar e Khas and the Darbar e aam with striking work of stone jail. Rai Praveen Mahal: Rai Praveen Mahal was built in honor of Rai Praveen, the beautiful paramour of Raja Indrajit. The reputation of her beauty and talent had reached the Mughal court; and emperor Akbar wished to see her. Raja Indrajit did not relent and he was threatened by Akbar with a fine of one crore rupees. At this, the litterateur poet Keshav Das was told to accompany Rai Parveen to the Mughal Court at Agra. Laxminarayan Temple: This temple was built by Bir Singh Deo and was later renovated by Raja Prithvi Singh C. 1793. This temple was truly unique as it blends temple and fort architecture. Chaturbhuj Temple: This was where the idol of Ram was originally supposed to be enshrined. 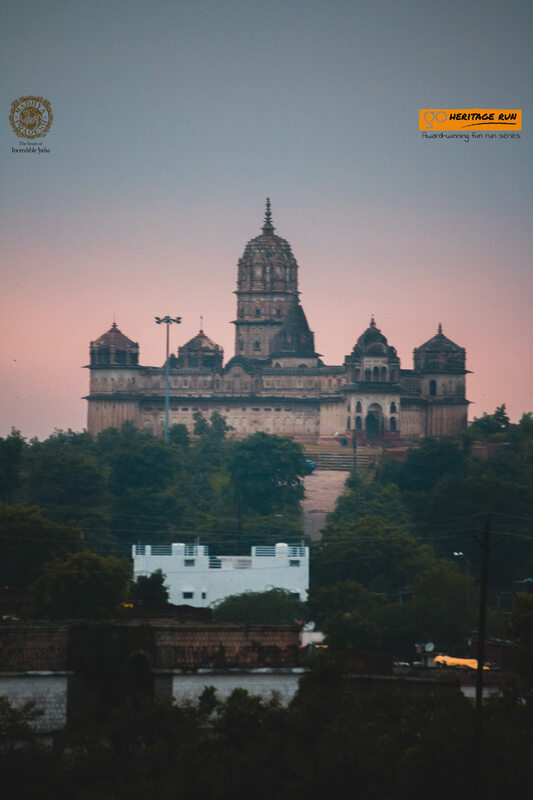 The temple dominates the town of Orchha by its sheer size, its towering shikharas seem to reach out to the sky. Built on a 4.5m high platform one has to climb a flight of steps to reach the temple. 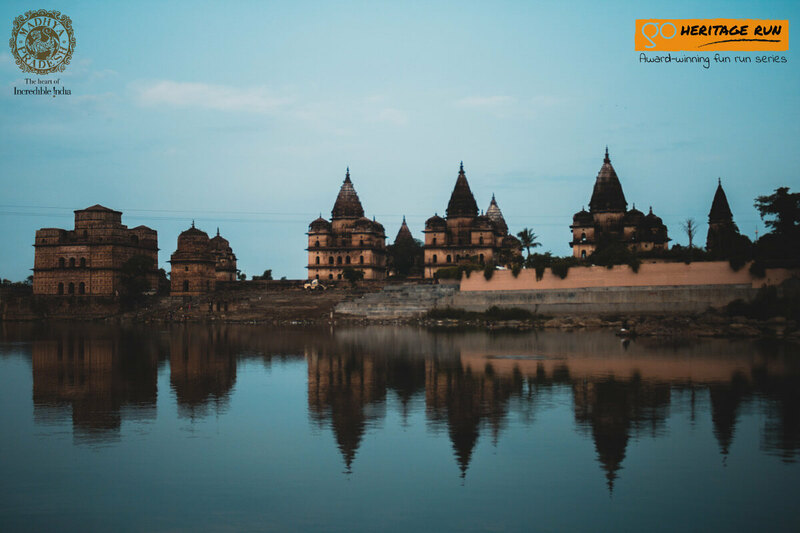 Orchha Bird Sanctuary: It’s one of the most scenic sanctuaries in Madhya Pradesh. Spread over an area of around 46 sq km, the Sanctuary gains importance due to rich avifauna, Betwa River and some rare varieties of plants. Bundela Chattris/Cenotaphs: Fifteen cenotaphs to the Bundela kings and members of their clan are located on the southern bank of the river Betwa. 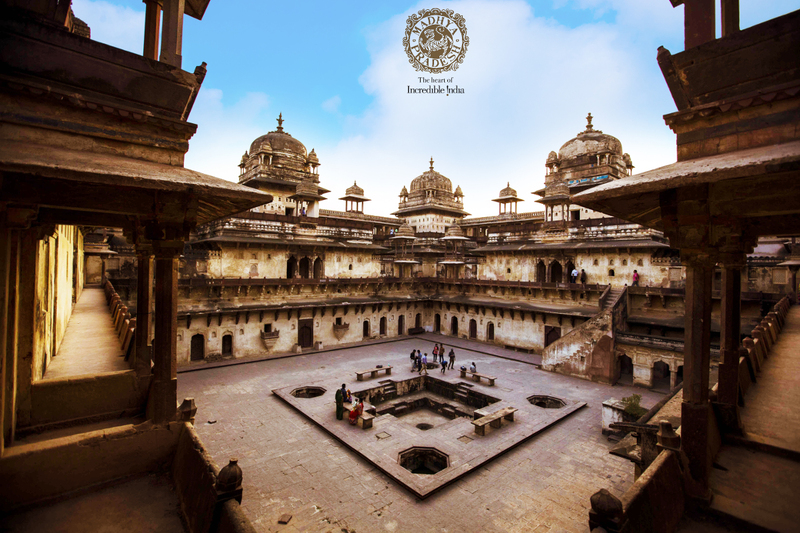 These include the cenotaphs of Madhukar Shah, Vir Singh Deo, Jaswant Singh, Udait Singh, Pahar Singh and others. Most of the cenotaphs are designed in Panchyatan style. They are constructed on an elevated square platform. 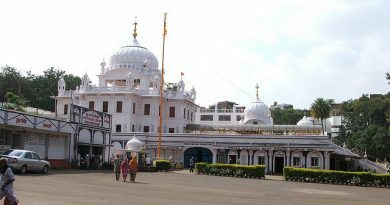 The sanctum sanctorum also is square shaped and in the center. 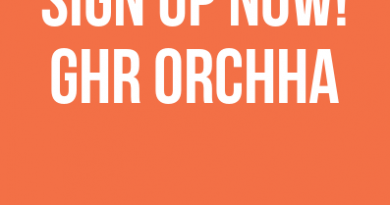 The upper portion has been made angular with arches. The peak of the sanctum sanctorum is patterned in the Nagar style of temple architecture.